Much has been written, said, rumored, about Iran – about Persians. By Persians and non-Persians alike. Some true – some pure fiction – some thoughtful – some ignorant – some just plain uninformed. But the one Persian quality that can be wholeheartedly agreed upon by everyone across time and borders is the generosity and excellence of Persian Hospitality. It’s legendary. (Check out Anthony Bourdain’s FB posts about his recent trip to Iran) If you’ve ever been invited to a Persian home you know what I’m talking about. It can’t be helped; it’s in our blood. For better or for worse. You are eight years old. As directed you climb up on a stool to reach deep into the very back, dark crevices of the kitchen cabinet to fetch extra tea cups. Clear ones of course, so the deep sunset hue of the tea can be collectively admired by all. Perched on top of the kitchen counter – delicately handling the jingle-jangle of the cups – you watch your mother conduct a symphonic feast. She frets about not having enough food prepared. Your eyes dart back and forth from the Aash, to the 3 different kinds of Koresh, the Rice, the overflowing tray of Sabzi Khordan, and the Baghali Ghatogh. Your brother marches through with all the confidence and pride of his assigned role – Spear Carrier #1. He diligently gets to work placing tender, fragrant meat on very sharp and very long metal skewers. Out of the corner of your eye you spy your father on the balcony fanning the burning coals with a piece of cardboard, with the command and authority of a general. It is all a well-rehearsed and well-orchestrated operetta. A typical Saturday night. You are now an adult with your own home and kitchen. You get busy writing your own Saturday night libretto. Commander General is what your husband lovingly calls you at times like this. You wear the label with pride. You begin your pas de deux with your rather brutish love interest – the stove – simply referred to as Viking in the program. You fret about whether the rice is burning, the Tahdig crisping up properly, the 2 stews humming in pitch-perfect notes. You should have made more food you say to no one in particular. Your girls look at you incredulously as they reprise their roles as table-setters numbers 1 and 2. Your husband walks through with the very sharp and very long metal skewers – he has fully embraced the role of Spear Carrier. In one swift move you pass him the tray of kababs. As the symphonic cacophony of sounds and aromas builds to a crescendo, you can’t wait to sink your teeth into your newest obsession – Louisa’s Tempeh Kababs. I first met Louisa Shafia over a year ago. She was hosting a dinner event at Cortez in Echo Park (sadly since closed) featuring dishes from her beautiful cook book The New Persian Kitchen. Prior to the dinner Louisa and I had exchanged a couple of emails, primarily me gushing about her book and she graciously taking the time to respond. The first thing that that struck me when meeting Louisa was her genuine warmth and infectious smile: the very same qualities that radiate through The New Persian Kitchen. 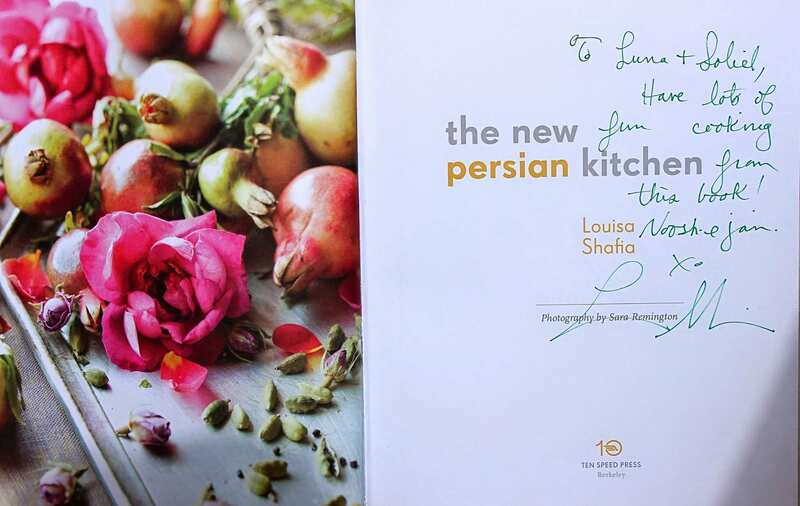 In her book, Louisa graciously invites you on a journey and discovery of Persian food. Persian food for the modern kitchen – for the everyday kitchen – for my kitchen. What I love about The New Persian Kitchen is how Louisa incorporates what she calls “new world” ingredients into the many tried-and-true dishes – a combination that speaks to the way I cook in my own kitchen. One of the many recipes I was intrigued and inspired by in The New Persian Kitchen is this Tempeh Kabab which has become a grilling staple in our house. It has its own place right next to the Jujeh Kabab, Kabab Koobideh and Kabab Barg. Although I have tried tempeh in restaurants before, this was my first time cooking with it at home. And with this recipe I am now officially a tempeh convert. Tempeh is fermented soy. Because it is fermented it makes it a highly digestible food boasting many nutritional benefits. And unlike most other soy products that are highly processed, tempeh is considered a “whole food.” I buy my organic tempeh at Trader Joe’s or Whole Foods and prefer the one marked original (I’ve tried the 3 grains one and haven’t enjoyed it as much). From my limited experience with tempeh I recommend marinating the kababs overnight for a full flavor impact (Louisa even recommends marinating for up to two days). 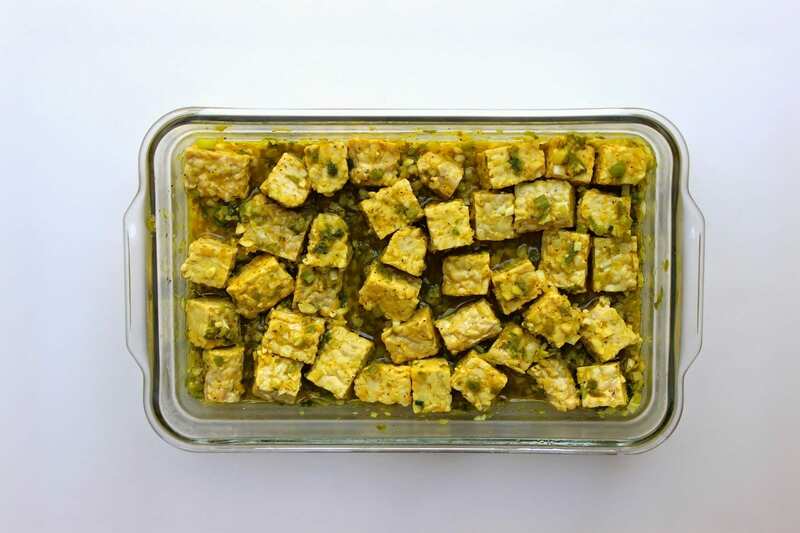 The simple marinade of turmeric, scallions, lime juice, garlic and pepper makes the otherwise bland tempeh burst with flavor. These tempeh kababs shine all on their own for vegetarians and non-vegetarians alike. Louisa suggests serving these kababs with a minty-cilantro sauce, which is delicious. However, on occasion (because I was too lazy to make the sauce) I have served the tempeh kababs on their own with the scallion marinade on the side (since tempeh is plant based you can eat the marinade without cooking it). And let me tell you – the slightly tart marinade is delicious and a hit every time we serve it. It’s a perfect accompaniment to the kababs, like a salsa or torshi (Persian pickles). I have even used leftover marinade the next morning in our scrambled eggs or frittata. 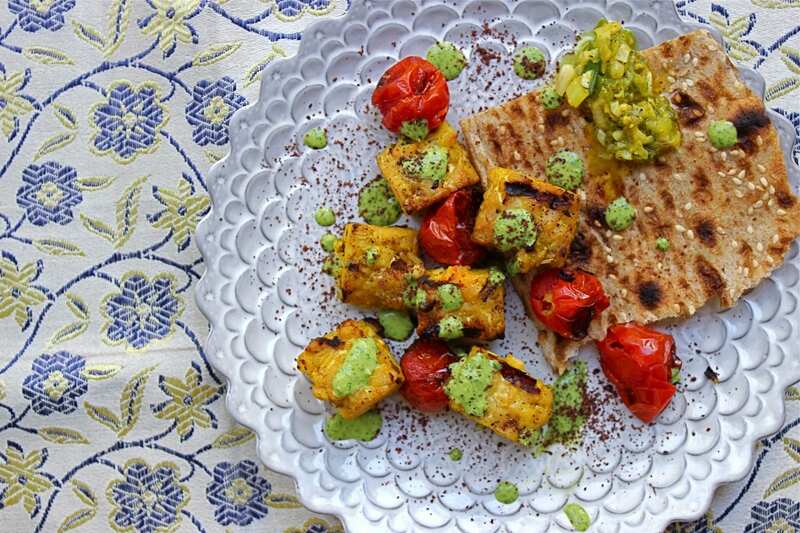 You can serve Louisa’s Tempeh Kababs any which way you like – with some fragrant basmati rice, wrapped up in lavash or sangak bread, or with a side salad – for a perfect summer meal. 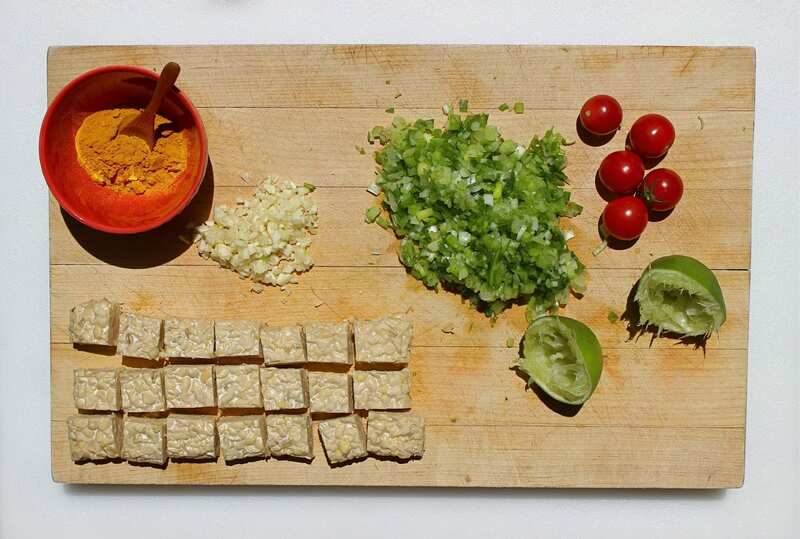 So get your grill going – time to serve up some Tempeh Kababs. The New Persian Kitchen is one of those cook books that is timeless and sure to become a classic. Drew and I had Louisa inscribe our copy to Luna and Soleil. The perfect heirloom to pass down from generation to generation. The curtain rises and you welcome your guests. They remark on the delicious aromas coming from the kitchen. You say you hope they like Persian food. They compliment your rug – you are almost compelled to say that it means nothing to you and that it would make you happy if they took it. Their eyes would widen with joy and bewilderment. They would look back to the rug expectantly. Are they really thinking of rolling it up?? Tarof, the Persian art of humbling oneself and putting your guests’ needs and comfort above your own, would be lost in translation. You thank them kindly, gently steer them away from the rug and towards the dining room and the Tempeh Kababs. I pretty much stick to Louisa’s recipe here with only minor adjustments. I have reduced the amount of pepper since the girls will bail on anything if they detect any heat. 1- In a large bowl whisk together the scallions, oil, lime juice, turmeric and garlic with 1 tablespoon salt and 1 teaspoon pepper (Louisa uses 2 teaspoons pepper). Add the tempeh and toss to coat well. Transfer to a container with a lid and marinate in the refrigerator, for at least 1 hour or up to 2 days (I marinate overnight). 2- Thread the tempeh onto the skewers about 1/4 inch apart with a few tomatoes in between. If you have any leftover tomatoes give them a quick toss in the marinade and skewer them separately. 3-If you will be serving the Minty Cilantro-Lime Sauce reserve 1/4 cup of the remaining marinade for basting and pour the rest into a blender. Add the mint, cilantro, and yogurt. Blend until smooth to make sauce, then season with salt. 4- Prepare a hot grill. Grill the skewers, basting a few times with the marinade, 4 to 5 minutes per side, until the tempeh begins to char. Transfer the tempeh skewers (and any tomato skewers) to a serving platter. Spoon some of the sauce (if using) over the tempeh and put the rest in a bowl for dipping. If not using the sauce put the marinade in a bowl and serve alongside the tempeh. 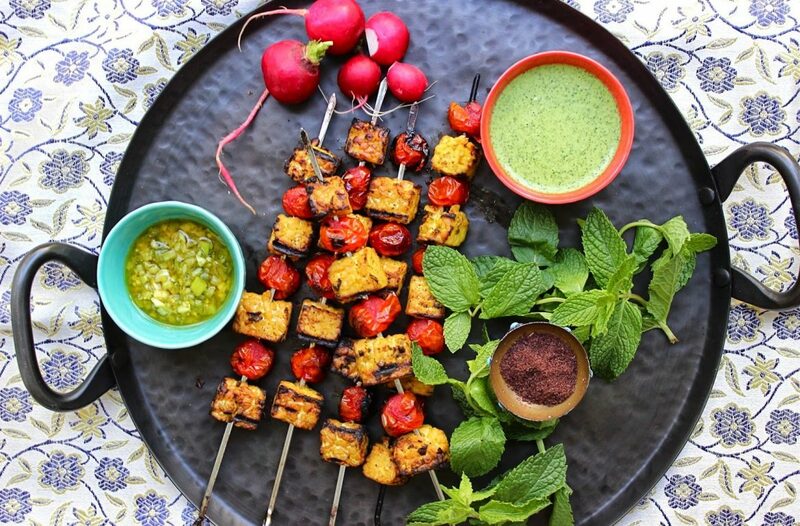 Serve the Tempeh Kababs hot and garnish with sumac to taste. My high school friends went through a vegan phase and that's how I discovered tempeh at a vegan restaurant we used to frequent. As far as meat substitutes go, whereas tofu is more of a quivering jelly type thing which I have to be in the mood for, tempeh is so toothsome and hearty I can eat it anytime (and it doesn't feel like I am missing out on real meat or anything). Ileana, the beet burgers are awesome as are so many of Louisa's recipes. You have a lovely blog! Thanks for stopping by. Amazing!! The smells coming from my kitchen were incredible. And the cilantro mint sauce was a hit. I've always liked tempeh, but now I'm a total convert. This dish was far better than any tempeh I've had in a restaurant. I love how much it soaks up flavor, better than meat. And the marinade is to die for. I don't have a grill, so I used a grill pan, and served it with lemon garlic broccolini. A marriage of citrus on the plate. My boyfriend liked it, although he's a bit of a carnivore and has requested it on chicken. Thank you Naz, this recipe is simple, yet the flavor is explosive, and made me feel like such a pro. J.S. – I completely agree with you. I much prefer tempeh to tofu. I've been making all sorts of delicious meals with tempeh lately. I hope T.J's starts carrying the organic – original tempeh soon. Thanks for sharing! Sarah – you are a pro! So glad you enjoyed this. And I do think this marinade would be great on chicken as well. Your lemon garlic broccolini sounds delicious. Nothing better than a citrus marriage! Thank you so much for all your kind words Sana'a! How wonderful that you've been to experience the deliciousness that is Persian cuisine!